Magna Prima Bhd, a niche property developer, has lined up several new launches in Kuala Lumpur and Selangor with a projected gross development value (GDV) of more than RM1 billion. First out of the blocks will be Phase II of a residential tower at the Boulevard Business Park in Jalan Kuching, Kuala Lumpur. 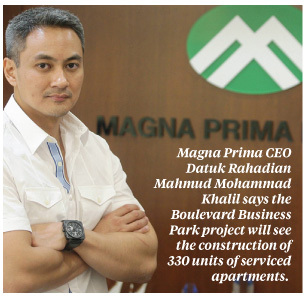 Magna Prima chief executive officer Datuk Rahadian Mahmud Mohammad Khalil said the project will see the construction of 330 units of serviced apartments with a GDV of RM220 million. "We have not finalised the actual name (for the project). We are just calling it Boulevard Business Park at the moment. We may change the name at a latter stage," he told Business Times. Rahadian said the company plans to hold a soft-launch for the project soon and, similar to its previous launches, the developer is confident of securing a high take-up rate for the units. "We have yet to launch the project but a lot of people have already registered their interests, a lot more than the number of units that we offer. So we can tell there will be a high take-up rate," he said. The units are priced at between RM414,200 and RM832,000 each. Rahadian said the company is also looking to develop a mixed residential and commercial project on its recently acquired 8ha plot in Shah Alam. "We will be submitting all the plans for approval this year and hopefully, we can launch the project in the first quarter of next year," he said. Early in June, Magna Prima announced that its unit, Magna Ecocity Sdn Bhd, was acquiring the 8ha for RM100 million. The company said the GDV of the proposed development was estimated at RM832.67 million and the total development cost was estimated to be RM624.83 million with an expected gross profit of RM207.84 million. Apart from this, Rahadian said the company is also planning the development of two blocks of residential apartments in Shah Alam. "This project, with a projected GDV of RM240 million, is slated to be launched in the third quarter of next year, probably in September," he said. JOHOR BARU: Demand for industrial properties in Johor is likely to remain positive based on the state's position as one of the top investment destinations in the country. Iskandar Regional Development Authority (Irda) chief executive officer Datuk Ismail Ibrahim said the current situation would create demand for industrial properties especially in Iskandar Malaysia. “Property developers should venture into industrial park projects to cater for the demand apart from the residential properties,” he told StarBiz. Ismail said Johor was still strong in the manufacturing sector and remained one of the top three destinations for foreign direct investments (FDI) in Malaysia. Statistics from the Malaysian Industrial Development Authority showed that it had approved 929 manufacturing-related activities for Johor from 2007 until April this year with RM41.48bil in investment. Of the figure, RM14.99bil (14.4%) came from the domestic investors and RM26.49bil (15.3%) from foreign investors. He said the manufacturing sector was the top recipient of the cumulative committed investments in Iskandar Malaysia from 2006 until June 30. It received RM32.71bil contributing 34% out of Iskandar Malaysia's total cumulative committed investments of RM95.45bil. The property sector came in second with RM29.80bil followed by utilities (RM9.52bil), government (RM7.31bil) and petrochemicals (RM5.10bil). Other sectors are ports and logistics (RM3.74bil), tourism (RM2.30bil), healthcare (RM1.60bil) education (RM1.55bil), creative (RM0.40bil) and others (RM1.69bil). “With Iskandar Malaysia moving on the right direction, local and foreign investors are now turning their gaze on us,” added Ismail. Johor's proximity to Singapore was an added advantage as many of the small and medium enterprises (SMEs) and multinational corporations (MNCs) were looking elsewhere to relocate their operations. “Logically, Johor Baru is the best choice for many of them as they could have the best of both worlds in two countries,” he said. He said new industrial parks within Iskandar Malaysia such as Senai Hi-Tech Park, Setia Business Park, Tanjung Langsat, IOI Kempas Utama and Southern Industrial Logistics and Clusters@Nusajaya were doing well. Ismail said to-date Singapore was the largest foreign investor in Iskandar Malaysia with total cumulative investments of RM4.56bil as at Dec 2011. Ismail said SMEs from Japan and MNCs from Europe, the United States and those based in China also had shown interest to relocate their operations to Iskandar Malaysia. He said Johor's manufacturing sector received a shot in the arm with the Government planning to transform Johor into a leading electronic manufacturing services hub in the country and the region. KUALA LUMPUR: PropertyGuru Malaysia, a real estate online portal with over 115,000 property listings, expects the property sector to remain strong, spurred by the quality of products coming into the market. Although 82 per cent of respondents to its second quarter Property Sentiment Survey 2012 perceived current residential property prices as expensive, those priced RM150,000 to RM500,000 will continue to receive strong response, said its country manager, John Paul Sta Maria. "Fuelled by liquidity in the market, banks are still willing to lend, albeit with stricter criteria and interest rates are still generally low, supported by population growth and urban migration," he said. According to the survey, 70 per cent of the responses feel that property prices will increase in the next six months, as compared to 86 per cent in the same survey done in the second quarter of last year. Some 36 per cent of the responses are holding developers as responsible for pushing the rising construction costs and high land prices to consumers. Around 20 per cent are blaming buyers as pushing up prices, and 10 per cent say it is due to competition with foreigners. PropertyGuru Group provides an integrated media platform that property developers and agencies can use to promote their brands and generate sales leads. The group has direct presence in Singapore, Malaysia, Thailand and Indonesia, with partners in Hong Kong, Vietnam, Australia, India and China. In Malaysia, its clients include over 60 local property developers, and more than 120,000 buyers and 15,000 agents database. John Paul said based on the company's website traffic statistics, the majority of people who leverage on propertyguru.com.my are mainly locals, and about 18.4 per cent foreigners, led by Singaporeans. He said in an interview that the latest trend now is using mobile apps to buy and sell properties. 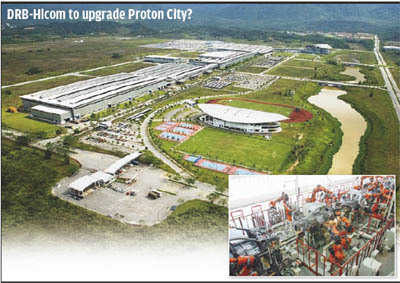 PETALING JAYA: The planned RM1bil investment by DRB-Hicom Bhd to accelerate the development of Proton City in Tanjung Malim, Perak over the next five years may be a move to consolidate Proton's manufacturing activities in a single location, automotive analysts say. They pointed out that news reports had claimed that Proton's manufacturing land bank of 250 acres in Shah Alam could have a gross development value of more than RM1bil. “We think that a property development play of the Shah Alam land bank would be a good move, as the value of the Shah Alam real estate can be extracted to fund Proton's plans,” said an analyst. However, other analysts pointed out that DRB-Hicom would need to look at issues such as the costs of moving the production facilities from Shah Alam to Tanjung Malim as well as employees' concerns. “It would not be easy because employees in Shah Alam are not keen on moving to Tanjung Malim. Also, would DRB-Hicom want to incur the one-time costs and deal with the hassles of moving all the equipment and facilities?” one analyst questioned. Another analyst said the reported planned RM1bil investment by DRB-Hicom was likely to be more of a property development play in Proton City. “Based on the news reports, this is not just about investing in machines and vehicle production facilities. Perak Mentri Besar Datuk Seri Dr Zambry Abdul Kadir had spoken about infrastructure development in the area, including better road access to Proton City from the North-South Expressway as well as building commercial areas and schools,” he noted. OSK Research said in a report late last year that a potential sale of Proton's Shah Alam land bank could fetch at least RM500mil. The research unit also pointed out that DRB-Hicom could be keen on developing Proton's land bank in Shah Alam for its housing development arm. Automotive conglomerate DRB-Hicom took over and privatised national carmaker Proton earlier this year. Dr Zambry was recently reported as saying the development of the 4,000-acre Proton City is set to be re-ignited after slowing down since it started 15 years ago. According to Dr Zambry, DRB-Hicom plans to invest RM1bil in the next five years and make Tanjung Malim the main Proton car manufacturing centre. Dr Zambry said Tanjung Malim was not fully developed as an automotive city, and only about 30% of the land had been used. According to the Proton City website, the township consists of residential, commercial, institutional as well as industrial parcels with seven lakes. It is located about 5km north of Tanjung Malim, and 90km from Kuala Lumpur. Besides the RM1.8bil Proton car assembly plant, it also houses Universiti Pendidikan Sultan Idris. On its website, Proton says Proton City is targeted to be fully developed by 2020, and aims to be home to Malaysia's automobile industry. However, some analysts say the development of Proton City is not a major priority for DRB-Hicom which needs to focus on rectifying the problems in the national carmaker and bringing it to greater heights. RHB Research analyst Alexander Chia said DRB-Hicom's focus must be to fix issues at Proton. Chia said Proton's vehicle manufacturing plant in Tanjung Malim presently had a capacity utilisation rate of between 40% and 50%. “DRB-Hicom needs to bring in a technology partner. Volkswagen is a possibility. Such a deal has to be win-win for all parties involved. Perhaps Volkswagen can use the extra capacity at Proton's facility in Tanjung Malim as an assembly hub to expand its presence in Asean,” said Chia. The Proton plants in Tanjung Malim and Shah Alam presently have an annual production capacity of 150,000 and 200,000 vehicle units respectively. Last year the Tanjung Malim plant produced 52,235 units while the Shah Alam facility produced 114,645 units. However, the Proton plant in Tanjung Malim can be expanded to have a maximum production capacity of up to one million cars per year. Meanwhile, HwangDBS Vickers Research said in a recent report that Volkswagen's production capacity at DRB-Hicom's Pekan plant would be progressively ramped up to 50,000 units by 2017 or 2018 to pave the way for exports to the Asean market. It also noted that as the Volkswagen Group owned other marques such as Audi, which DRB-Hicom is already distributing in Malaysia, there is potential for similar tie-ups. The research unit said DRB-Hicom was gearing up for regional expansion and was ready for the eventual saturation of motor vehicle sales locally. It also noted that with DRB-Hicom's key executives now in Proton, the focus was on procurement to ensure stringent quality control, to migrate the dealerships to a full franchise to reduce costs, and launch a Perdana replacement model within 18 months to fill the void in the D-segment. According to HwangDBS Vickers Research, DRB-Hicom is still discussing with other automotive majors to take strategic stakes in Tanjong Malim. “We have assumed the acquisition would be dilutive, leaving room for upgrades whenever there are synergies. For now, earnings delivery is vital,” said the research unit. Meanwhile, OSK Research said recent news reports claiming Volkswagen was still keen on Proton was not entirely surprising, given the former's quest to set up a manufacturing plant catering for the Asean region. “Proton's plant in Tanjung Malim could be the best fit for Volkswagen in establishing its hub,” said OSK Research. It also pointed out that Proton's performance in the second quarter of 2012 was dismal, with year-on-year vehicle sales dropping by 6.4% to 37,753 units. CIMB Research pointed out that Volkswagen presently had less than 1% market share in Asean, which is in stark contrast to its top position in China and in Europe, and its number three position in the United States. “Therefore, the DRB-Hicom and Volkswagen partnership is essential in plugging the Asean gap in Volkswagen's global market and helping it achieve its target of becoming the world's largest auto manufacturer by 2018,” said CIMB Research. The research unit also did not rule out the possibility of Volkswagen's equity participation in Proton in the future, going by the German carmaker's past partnership record when it took an initial 30% equity stake in Skoda and a 19.9% stake in Suzuki. DESPITE WCT Bhd's 19% decline in earnings before interest and taxes year-on-year in the first half of financial year 2012, it is a favourable player in the construction sector, with 87.5% of research analysts calling it a “buy”. With an outstanding order book of about RM4bil, it is not hard to understand why. On the property front, its gross development value (GDV) was also given a lift to about RM12bil with its latest purchase that came as a “positive surprise”, according to an analyst. Its latest proposed acquisition announced on Aug 23 is a deal between its indirect subsidiary WCT Hartanah Jaya Sdn Bhd and Idaman Usahamas Sdn Bhd, a unit of Malaysia Building Society Bhd. The 12 acres in Tebrau, Johor Baru that comes with an abandoned shopping podium will be bought for a consideration of RM180mil. The freehold land is proposed for mixed development with a GDV of RM900mil. About a week before that, it has announced that its tender for the construction and completion of Batinah Expressway Package 2 in Oman was accepted. Winning this bid via its 80:20 joint venture with Oman Roads Engineering Co LLC means it has bagged a contract worth RM1bil and would contribute positively to its earnings for this financial year until the financial year ending 2015. The 44.75km expressway is expected to be completed in three years. These are two of the latest developments that continue to put the company in a positive light. Looking at some of its other outstanding jobs, it has a government administrative office project and New Doha International Airport in Qatar. Locally, it has PLUS Highway widening works, KL International Airport 2 (KLIA 2) earthworks, the Medini Iskandar contract and others. WCT has also secured contracts from Vale Malaysia Manufacturing Sdn Bhd for jobs at the latter's iron ore hub in Teluk Rubiah, Perak. It also has in hand building projects such as the Kota Kinabalu Medical Centre and Riverson and the International Trade and Industry Ministry headquarters. That is not all. The company has a order book of about RM4bil. Some of the good prospects, according to analysts, include earthwork packages for Pengerang Rapid in Johor, Tun Razak Exchange projects in Kuala Lumpur, a teaching hospital in Sabah and the United Arab of Emirates expressways. It is also in the running for contracts from the My Rapid Transit and Langat 2 water treatment plant projects. From its property development arm, projects include its RM4bil mixed development in Overseas Union Garden, Kuala Lumpur. In Rawang, Selangor, it is developing a township with a gross development value of RM1.5bil. Prior to that, it has developed its flagship township development in Bandar Bukit Tinggi, Klang. It chalked up property sales in the first half of RM376mil while its unbilled sales stood at RM563mil. As for recurring income, it has built pipelines from construction concessions on one hand and rental yield from its shopping malls on the other. The Paradigm Mall which was completed since May is considered a success due to its high occupancy rate of about 97%. Its Premiere Hotel in Klang completed since 2010 has 250 rooms and it is opening up another 350-room hotel at Paradigm which is expected to be ready in 2014. However, it was not rosy all the way. Just a year ago, WCT's construction business was lacklustre. The company is still in a legal tussle with Meydan LLC over a terminated racecourse in 2009. The financial impact following the outcome of the proceedings remains unknown. Its better performance this year is described as a comeback. With the opportunities available from the Economic Transformation Programme plus the 10th Malaysia Plan and good take-up rate for its property segment, analysts are bullish about the company. A check from Bloomberg's data showed that 87.5% of the analysts have given it a “buy” call, with RM3.22 as a 12-month consensus target price. The counter was lowest on Jan 15 at RM2.18 and it reached a peak of RM2.78 on Feb 9 this year. Year to date (YTD), as of Aug 24, the stock increased 18.94% from RM2.27 to RM2.70. At this rate, it is outperforming the FBM KLCI which has increased 8.92% YTD. The benchmark FTSE Bursa Malaysia Kuala Lumpur Composite Index (FBM KLCI) hit an all-time high of 1,655.39 points last Wednesday before easing off to close at 1,648.22 at the end of the holiday-shorterend week. Its lacklustre performance stemmed mainly from the weaknesses on the US and Asian stock markets. The benchmark index hit an intra-week and all-time high of 1,655.39 on Wednesday before slipping back to an intra-week low of 1,647.90 on Thursday, giving a trading range of 7.49 points. The FBM KLCI recorded a week-on-week loss of 1.57 points, or 0.10 per cent. Among other indices, the FTSE Bursa Malaysia Small Cap Index eased 73.29 points, or 0.59 per cent, to 12,308.61 while the FTSE Bursa Malaysia ACE Market Index gained 71.68 points, or 1.58 per cent, to 4,612.68. On the foreign front, the New York Stock Exchange consolidated its recent gains last week. The Dow Jones Industrial Average shed 0.88 per cent. The Hong Kong stock market continued to consolidate and the Hang Seng Index fell 1.14 per cent. In Tokyo, the Nikkei 225 Index posted a week-on-week loss of 1 per cent. Technical pullbacks in index-linked counters sent the FBM KLCI below its immediate support of 1,650 points when it closed at 1,648.22 on Friday. Selected property counters managed to outperform some of the Main Board counters last week.KLCC Property Holdings Bhd was one of these counters. KLCC Property staged a technical rebound last week. Its daily price trend closed at RM5.65 on Friday, posting a week-on-week gain of 36 sen, or 6.81 per cent. Moving Averages: KLCC Property's daily price trend stayed above all its 10-, 20-, 30-, 50-, 100- and 200-day moving averages. Momentum Index: Its short-term momentum index stayed above the support of its neutral reference line last week. On Balance Volume (OBV): Its short-term OBV stayed above the support of its 10-day moving averages. Relative Strength Index (RSI): Its 14-day RSI had since stayed above the 50 level. Its technical reading stood at the 71.72 per cent level at the market close on Friday. Chartwise, KLCC Property's monthly price trend staged a technical breakout of its immediate overhead resistance last week. This augurs well for its intermediate- to long-term perspectives. Its weekly price trend staged a successful technical breakout of the neckline of its double-bottom pattern formation (see KLCC Property's weekly price chart B1:B2) last week. At the market close last Friday, it remained above its intermediate downside support (B1:B2). KLCC Property's daily price trend traced out a stair-stepped uptrend in a technical breakout of its short-term overhead resistance (see KLCC Property's daily price trend B3:B4). 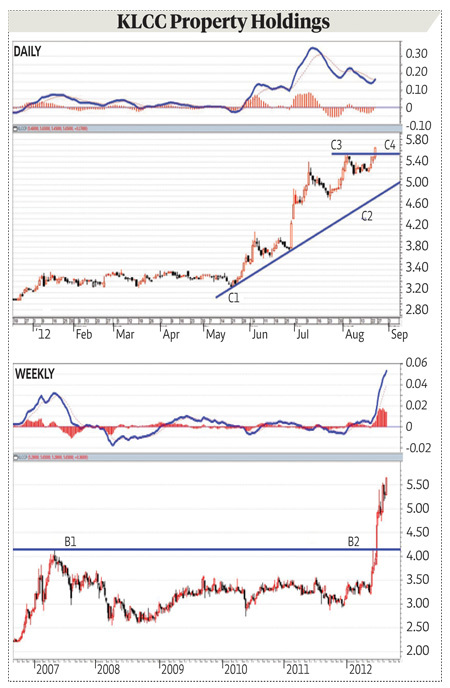 It continued to stay above its intermediate-term uptrend support (B1:B2) at the end of the week. Its daily fast MACD (Moving Average Convergence Divergence indicator ) traced out a "golden cross" of its daily slow MACD at the market close last Friday. This bodes well for its short-term perspectives. Its weekly and monthly fast MACDs continued to stay above their respective slow MACDs. Its 14-day Relative Strength Index (RSI) stood at the 71.72 per cent level. Its 14-week and 14-month RSI were at the 80.98 and 88.61 per cent levels respectively. 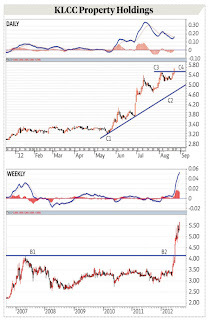 Combining the bullish technical breakouts on its weekly and daily charts (B1:B2 on its weekly chart and C3:C4 on its daily chart), KLCC Property's daily price trend is poised to stage a follow-through technical rebound, and rechallenge its immediate overhead resistance (RM5.75-RM6.00) over the intermediate term. The subject expressed above is based purely on technical analyses and opinions of the writer. It is not a solicitation to buy or sell.